The evening will take the form of a practical workshop, sketching from real natural history objects such as shells , skulls, feathers etc. So please bring your sketch books , pens, pencils and watercolours. 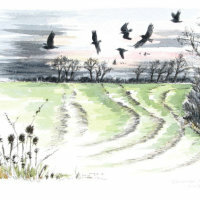 Ann Biggs is a well-known artist who is passionate about wildlife and spends many weekends with her sketch book at nature reserves in Norfolk and Suffolk. Her sketch books are a joy.